I’ve been writing lots of short comics reviews lately, so I thought I’d compile them into blog posts periodically. I proudly present Short Cuts 1. 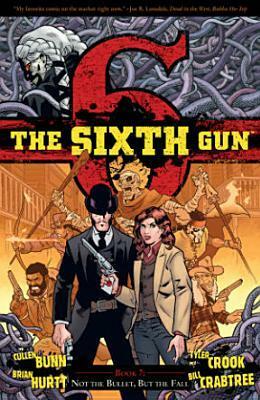 This morning I finished The Sixth Gun Book 7: Not the Bullet, But the Fall. I only recently read that the creators’ creed for the title is “no one is safe” (just like The Walking Dead). That’s certainly proving true here. The previous collection had the unexpected demise of one of the major villains; this one has has four apparent deaths (possibly five) among the group of heroes. The description on the back cover says “This is the beginning of the end!” I believe the series conclusion is set for issue 150, which is only 9 issues off. They have actually starting putting out deluxe hardcovers combining two TPBs plus extras, similar to the recent DC model. So if you wanted to start reading the series and prefer hardcovers, here’s your chance! As a supernatural Western, the most obvious point of comparison would be Jonah Hex (at least in some of the versions of it). But I find myself constantly thinking about Hellboy instead. This story also has a sense of doom hanging over it, and the protagonist Drake Sinclair even has an apparent curse hanging over him personally, similar to the demonic origin that Hellboy must fight against. And the fate of the whole world hangs in the balance here as well. Also, there’s lots of monsters. 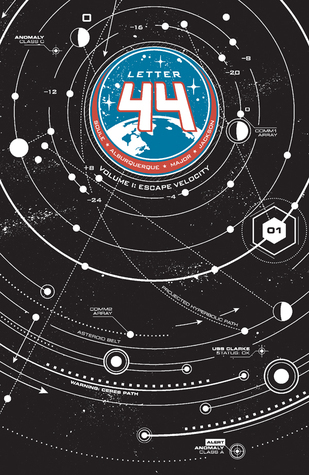 Letter 44 Volume 1: Escape Velocity collects the first six issues of the series. It’s a great concept: newly elected President Stephen Blades opens a letter from his predecessor which immediately changes the agenda for his first term. NASA has discovered an alien presence in the asteroid belt, and a manned mission was sent to investigate when probes were unable to send back good information. The mission is so secret that only the President and a few close advisers know about it, so it comes as a complete surprise. In the first two issues we learn that it is feared that the alien’s intentions are not peaceful. They’re using some sort of electronic blanket of secrecy around the project in the asteroids, and they have made no attempt to communicate with Earth–something clearly within their technological capabilities. We also meet the ship’s crew, a volatile collection of scientists and military. The commander has gotten pregnant during the mission, a fact which the crew has kept secret. And they penetrate the barrier, finally getting a good look at the huge object the aliens are building, which they dub the Chandelier. They’re not sure what it does, but that’s what it looks like. That’s just two issues! I think it’s safe to say that Soule can’t be accused of decompressed story telling. Everything you thought you knew about the former President’s actions turns out to be wrong. Or most of it, anyway. Former President Carroll appears to be working behind the scenes to maintain the agenda he had while in office. So the politics are really messy. But the crew of the Clarke is having lots of adventures, too. Either story could be enough for a comic. I like the way Soule juggles them. Most issues have two cliffhangers instead of just one! 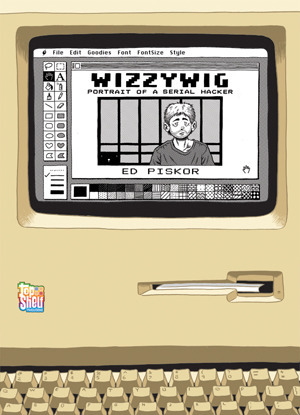 Wizzywig: Portrait of a Serial Hacker is Ed Piskor’s first graphic novel, published by Top Shelf in 2012. I’ve had it on my Kindle Fire for awhile from one of the Humble Bundles, and my three-day weekend is a good time to finally crack it open (virtually). It tells the story of Kevin “Boingthump” Phenicle, a legendary computer hacker from the early days of computing. Apple co-founder Steve Jobs is the obvious reference point, but only in general terms (Piskor has fun depicting Boingthump’s interactions with Jobs and his partner Steve Wozniak). The story shifts between past biography and present media commentary. So we learn early on that the protagonist will wind up in prison, while also seeing him learn about computers and become a hacker. Visually it’s drawn in a black and white cartoon style in the underground comix tradition. It’s a fun book, especially if you have any history with hacker culture. It goes all the way back to phone hacking and dial-up modems, and the days when hackers were often portrayed as a public menace in the mass media. It has a strong reality base, although no real-life hackers went through quite as much as the protagonist does here, at least as far as I know. It also helps to have a history with underground comix, because it’s very much in that tradition. That includes the cartooning style as well as the militant anti-establishment tone much of the time. There’s plenty of humor, too. Piskor puts a bunch of jokes about cartoonists in the crawl of a network broadcast he draws late in the book, for one example. This entry was posted in graphic novels, indie comics and tagged Alberto Jiménez Alburquerque, Brian Hurtt, Charles Soule, Cullen Bunn, Ed Piskor, Tyler Crook. Bookmark the permalink.